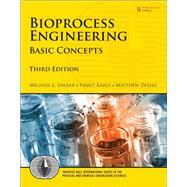 Bioprocess Engineering, Third Edition, is an extensive update of the world’s leading introductory textbook on biochemical and bioprocess engineering and reflects key advances in productivity, innovation, and safety. The authors review relevant fundamentals of biochemistry, microbiology, and molecular biology, including enzymes, cell functions and growth, major metabolic pathways, alteration of cellular information, and other key topics. They then introduce evolving biological tools for manipulating cell biology more effectively and to reduce costs of bioprocesses. The text makes extensive use of illustrations, examples, and problems, and contains references for further reading as well as a detailed appendix describing traditional bioprocesses. Dr. Michael L. Shuler is Samuel B. Eckert Professor of Engineering at Cornell University. He directed the School of Chemical Engineering (1998-2002) and was founding James and Marsha McCormick Chair for Biomedical Engineering (2004-2014). He also directs the Center on the Microenvironment and Metastasis (CMM), funded by the National Cancer Institute as a Physical Sciences - Oncology Center. He has received numerous teaching, advising, and research related awards, and has been elected to the National Academy of Engineering and the American Academy of Arts and Sciences. Fikret Kargi is Professor in the Department of Environmental Engineering at Dokuz Eylul University. His interests include bioprocess engineering, environmental biotechnology, wastewater treatment, biotechnology-bioengineering, and waste bioprocessing. He holds a Ph.D. in Chemical/Biochemical Engineering from Cornell. 1. What is a Bioprocess Engineer?